Sicilian-born ricotta salata is a clean, white ricotta cheese that’s simply been pressed, salted and aged. In other words, it’s ricotta, just with a stronger spine. Ricotta salata adds bright and moist, milky flavor to all sorts of dishes, and we love it for its just right, not-too-salty burst of flavor. In Wisconsin, we press and age ours for one to two months, and the end result is a smooth and firm, fresh and nutty, bright white superstar that pairs well with countless foods and drinks. 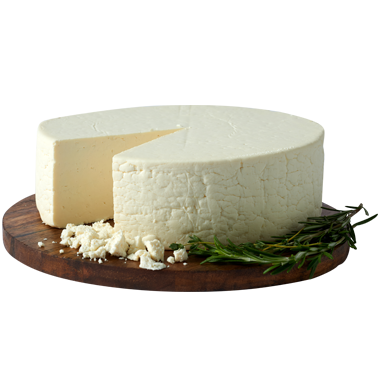 The most important feature of ricotta salata is its versatility.. It bridges the seasons really well and gets along with everything from big, meaty winter ragus to light summer salads. It also has a significantly longer shelf life than fresh ricotta. Light beers, bright and tart whites (whether sparkling or still) and rosés are our favorite with ricotta salata. If we’re doing the shopping, we’ll come home with bottles of bright and berry-packed rosé, off-dry prosecco, pinot grigio and a 6-pack of pilsner to pair with it. Meaty ragus, earthy mushrooms, cured sausages, crisp and flavorful greens and mounds of pasta all get along famously with ricotta salata. You can grate it, cube it or crumble it and team it with grilled pineapple, peaches and nectarines. Ricotta salata is also a no-brainer for a yummy antipasto platter and just about anything with pesto.